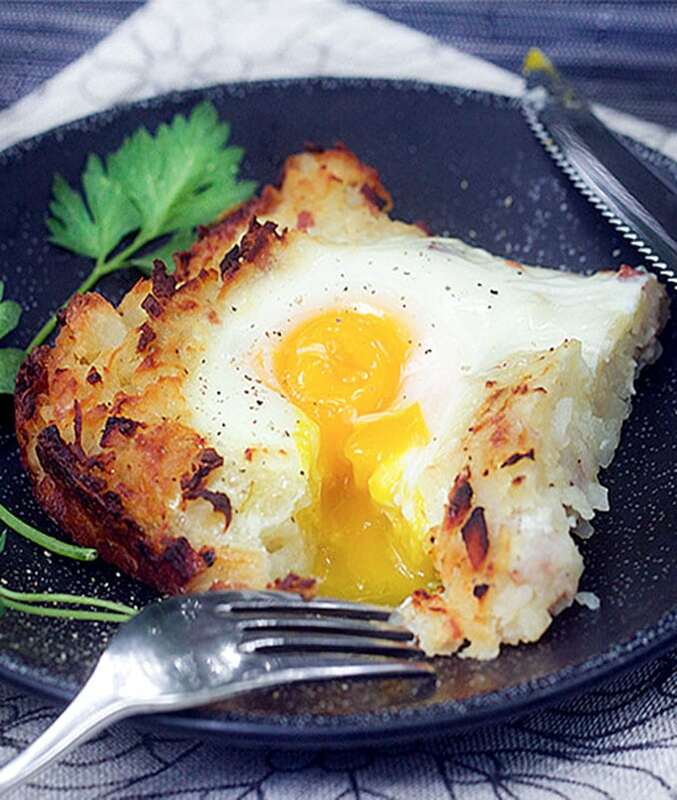 Imagine a giant potato pancake – crisp on the outside, tender on the inside – with onions, ham and melting cheese mixed in, and soft-cooked eggs baked on top. Doesn’t that sound amazing? 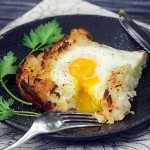 The recipe is inspired by a very old and popular Swiss dish called Rösti. 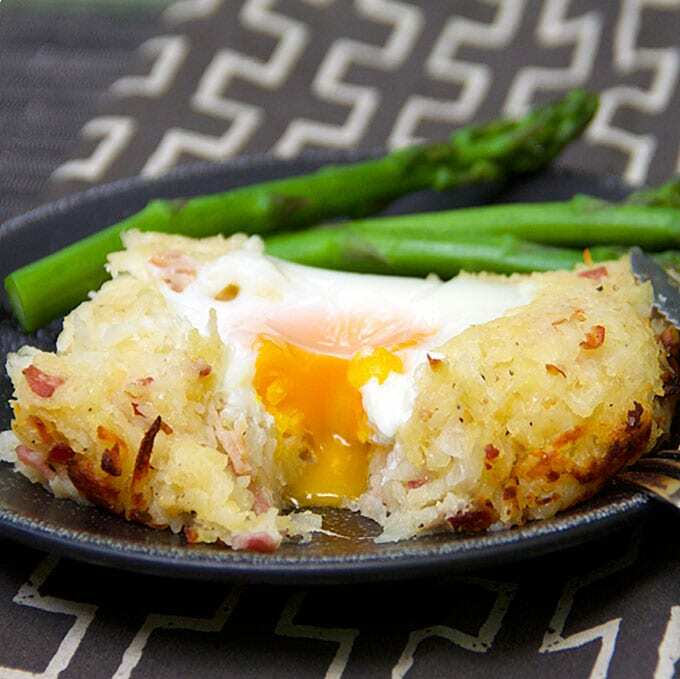 Rösti is up there with fondue and raclette as one of Switzerland’s most iconic dishes. Traditional Swiss Rösti is more like a pancake than a casserole and it is generally made by pressing shredded potatoes into a cast iron skillet to form a cake, and cooking it in hot butter until it’s brown on the outside and soft inside. Back in the early 1800’s it was a common farmer’s breakfast – cooked over the fire in a wood stove. 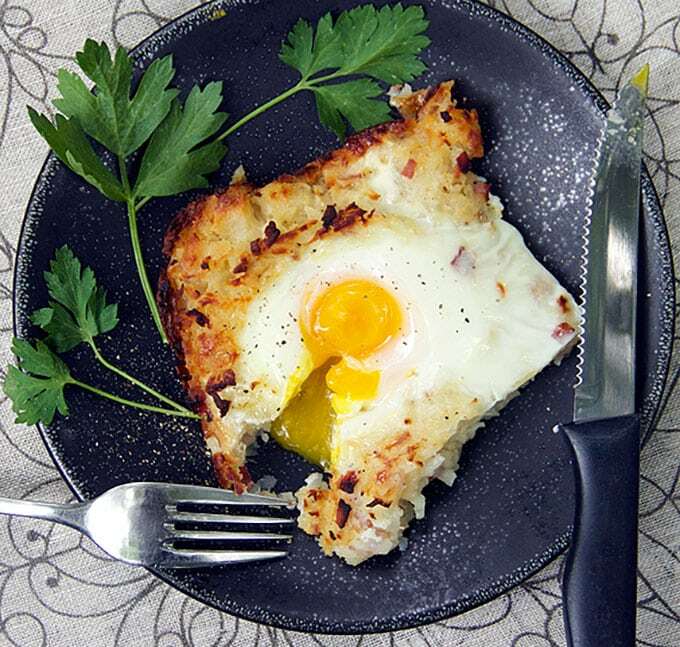 Nowadays in Switzerland rösti is served for breakfast, lunch or dinner – often as a hearty side dish for meat. I love the concept of making a rösti into a casserole. I got the idea from Cooking Light. I tweaked it quite a bit, mostly by adding ham and cheese and mustard to the mix. My version is definitely not as “light” but I think it’s a worthwhile splurge! I have to give a shout out to the technique I used here for the potatoes. I did a lot of research into how to achieve the desired texture for the potatoes – crisp on the outside, super soft and tender inside. I came across some debate about whether it’s best to simply grate raw potatoes or to go the extra step of boiling and cooling the potatoes before grating them. I tried both and the boiling method is the definite winner. First of all, you can just throw the potatoes into the boiling water, skin and all. Once boiled, the skin practically falls off by itself. 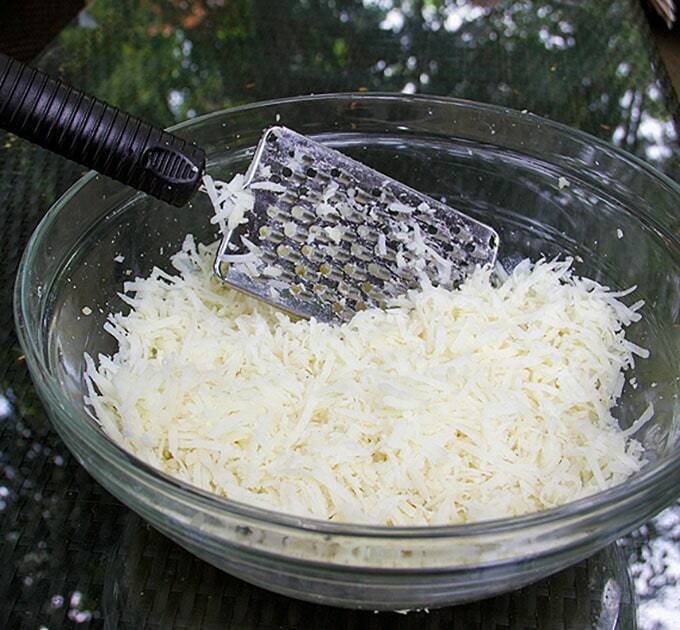 After chilling the potatoes, they are super easy to grate by hand. Then when you cook them, they are the perfect texture inside and out! I’m so happy with this new discovery that I’ll be making my potato pancakes this way in the future! 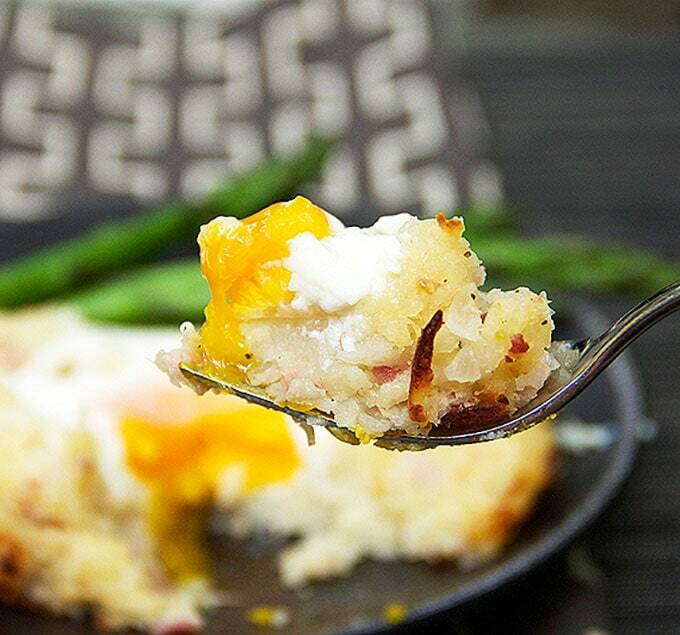 This potato casserole is perfect for a special brunch. Here’s the recipe for Swiss Rösti. If you try this recipe I hope you’ll come back to leave a rating and comment. I’d love to know what you think! 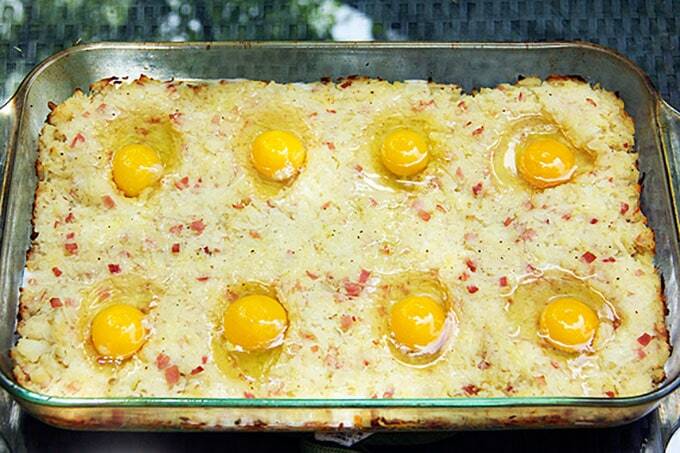 Shredded potato casserole with ham, cheese, and eggs baked on top. Perfect for breakfast or brunch. Optional garnish of fresh snipped chives, chopped parsley, sliced scallions, sour cream or plain yogurt. Cook & Grate Potatoes: Fill a large pot halfway with water and bring to a boil. Add potatoes and boil them for 1/2 hour. 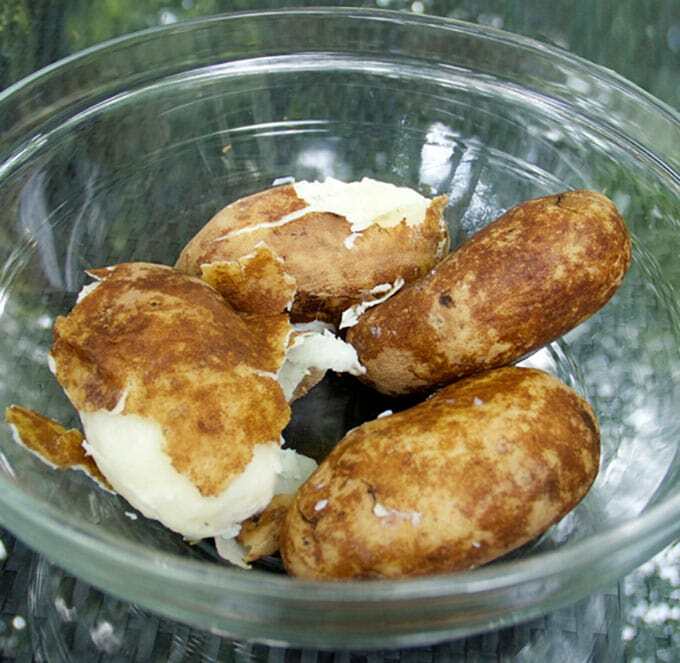 Remove potatoes from pot and cool them in the fridge for at least two hours or as long as overnight. Once cooled, peel potatoes and grate them into a large bowl using the large holes in a cheese grater. Saute Onions & Ham: Melt butter in a medium skillet over medium-low heat. Add onions and cook for 5 minutes, until translucent. Add ham and cook, stirring, for 2 minutes. Scrape the mixture into the bowl with the potatoes. Assemble the Casserole: Preheat oven to 400°F. 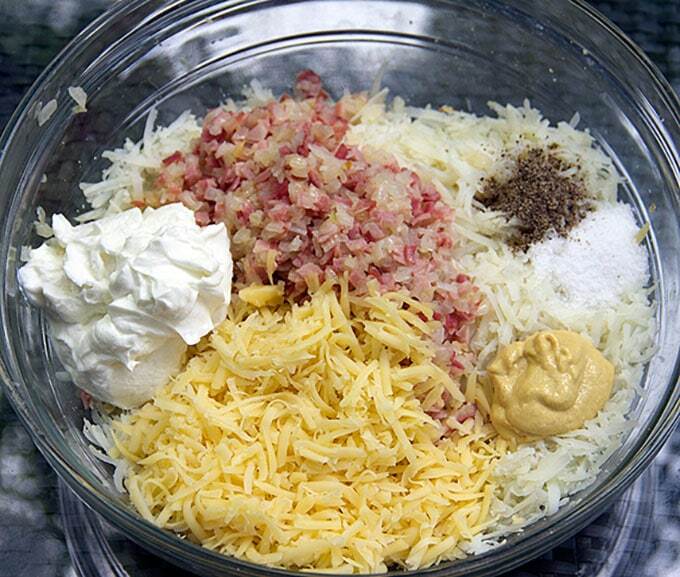 Add yogurt, mustard, cheese, salt, pepper and cayenne to the bowl with the potatoes, ham and onions. Toss gently to combine (I like using my hands for this) Spread potato mixture evenly into a baking dish (about 13 x 9–inch) coated with cooking spray or lightly oiled. Bake for 25 minutes. Turn the heat up to broil and cook for 4-5 minutes longer, checking every minute, until the top is lightly browned. Turn the heat back down to 400. Remove the casserole from the oven. With the back of a tablespoon, make 8 indentations in top of the casserole. Crack 1 egg into each hole. Return dish to oven. Bake at 400° for 10-12 minutes or until egg whites are firm and yolks barely move when pan is jiggled. Cut into 8 pieces. Garnish with chives, parsley or scallions, sour cream or yogurt, if desired. Serve immediately. For brunch or lunch, a simple green salad or steamed asparagus would be a good accompaniment. Stumbled on this recipe yesterday; absolutely delicious! Thank you for sharing. I already added it to my list of favourites. Hi Lisa — I just made this yet again. My son came home from college yesterday post-finals, and slept til noon today. He’s in heaven, lying on the couch, eating Rosti and watching sports-center. I made the full batch of potato mixture, but divided it into several baking dishes, one of which I will take to a neighbor who’s going through some tough stuff — it will be great comfort-food for them to cook up tonight for supper. We once had Rosti in Switzerland, on a raw afternoon, high in the Alps. I was so pleased to be able to make it at home. Thanks for showing me how! How much of this process can be done the night before? If I shred the potatoes and then refrigerate them will they turn brown? I would not suggest shredding the potatoes the night before because they might discolor. However, you can boil them the night before and they’ll be fairly easy to peel and shred the next day. Here’s what you can do the night before: grate the cheese and store it in a baggie in the fridge. Chop the onions and store them in a baggie in the fridge. Dice the ham and store it in the fridge, too. Measure the spices out into a small bowl and cover with plastic wrap. If you do all of that in advance, that should help a lot with speeding up the process the next day. Good luck with it – I hope you enjoy it. can frozen shredded has browns be used? Sure! I think they would work well. I am drooling over this casserole. Of course, anything that involves crusty potatoes begins with my vote and it only got better with that delicious-looking egg spilling out. Yum! This is totally going on my weekend brunch plans–I can’t wait to make this!!! I hope you enjoy it Kristen! I crave this dish!!!! I am such a potato eater to start with. The egg is cooked to absolute perfection. Wonderful way to jazzed up the potatoes too. I love this dish. Sounds amazing.. Can you halve the recipe? Yes, definitely. I would suggest cooking it in a slightly smaller casserole dish if you have one. If not, you might want to cut the initial cooking time by 5 minutes. Enjoy!